Are you a recent graduate from university or a technical college interested in building your career in a technical field? The BC Ministry of Transportation & Infrastructure is seeking recent graduates to join us in a variety of positions across the Province of British Columbia in our Technician Entry Level Program (TELP) or Engineer in Training (EIT) program. Wondering how you can learn more about our TELP or EIT opportunities? Come on out and join us during one of our information sessions! We’re hitting the road and bringing our passion for all things transportation to a school near you. We hope that you can make it out and learn more about how the Ministry of Transportation and Infrastructure is a great place to build your career. See you soon! When can I expect written assessment results and what next? The written assessment results are expected to be completed in about three to four weeks. After that, there may be a telephone interview and/or an in person interview to further determine suitability and best fit. Hope that this helps! I am a new immigrant from Bangladesh.I did my Masters in Management in 2006(published on 2009).Am I eligible for TELP program. Sorry, we are looking for applications from students who have graduated in the last 5 years. i’m wondering if there are any info sessions for the 2016 intake? Unfortunately this year we will not be holding any info sessions. If you have any specific questions you would like to ask us though, please do and we will be happy to get you an answer. Hope that this helps. When the 2016 application process for TELP will start? I have visited the TELP webpage and it says the process will end in Jan 22, 2016. However, the link there is not working. I am in the process of getting my application together and am wondering what to include in my resume and cover letter. When I apply, am I applying for a specific job or to the program in general? My M.A. is in Geography and Environmental Studies and I noticed each job description included an educational stream, two of which, mentioned Geography. Should I focus on those only? Any guidance on how I should proceed would be appreciated. Thank you! Thanks for your interest. I sent your question to the program coordinator. I’ll keep you posted. Hi Marne, thanks for asking. Please include in your resume and cover letter whether it is a TELP or EIT position you are applying for. Note: The EIT program has multiple job/geographic rotations annually over the course of the program – giving you the opportunity to train, develop and grow professionally. The EIT program is a great way to build a diverse portfolio and develop a broad-based perspective of the ministry. If you are interested in applying for a Bridge (structural engineering) or an Electrical position, you will need to identify that within your application as they are the only two positions that likely do not offer multiple job rotations. I earned a M.A. in Geography and Environmental Studies in December 2010. Am I still eligible to apply for the TELP/EIT program? I am interested in a career in transportation and am looking for something entry level to gain work experience from the ground up and your program looks like it would be perfect! If I am ineligible due to the length of time since my graduation, what would you suggest I do to gain work experience? Thank you in advance for your response and advice. These opportunities apply to recent graduates (within the last 5 years) with a diploma/degree/certificate in a transportation related field to one or more of the following: Civil Engineering Technology, Structural Engineering Technology, Geomatics Engineering Technology, Resource Management, Geotechnology, Geography, Survey and Business Administration, so sounds like you are qualified to apply. Here is the link! I just heard about the TELP and it sounds like a wonderful program. I am putting together an application for this year, but I was wondering if there is a particular person I should be addressing my cover letter to. Please address your cover letter to Chantelle Gergley. Good luck! Thanks! I submitted my application this afternoon. I did have one problem though: When I tried to send in my transcript to the email address in the posting as instructed the email bounced back with a message saying that the address doesn’t exist. Is there another email address I should be using? Did you use this email address? I am a 2014 graduate of the ARET program at TRU and I had applied last year to the TELP program. I had made it all the way through to the 4 room interviews and I thought I did pretty well. I did not get the job as I can only assume my location availability was not what they (you) were looking for. I was hoping to apply again this year because I really am interested in a career with TranBC. Am I able to try again? or was it a one shot kind of deal? By all means we encourage you to apply again. Were you given any feedback about how the panel made their final decision? If they were unable to place you do to your location, would you be willing to transfer to a new location? Thanks for replying, No I didn’t really get any feedback. I am willing to relocate yes. Okay – in the future, we recommend asking for feedback on where you may have fallen short during the competitive process, that way you can improve for the next round. TELP/EIT should begin in the new year, check back with us then and good luck! Yeah that is a shame I didn’t ask. I am looking forward to trying again. It really sounds like it would be a great career for me. Thank you! When is the TELP program starting up again? The TELP/EIT program should begin early 2015. Please check back with us and the employment opportunities website for updates. 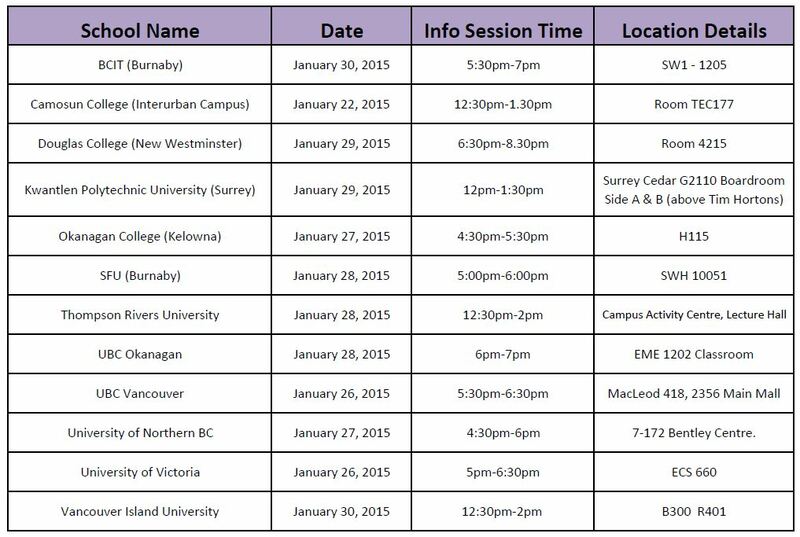 Is the BC MoT still accepting applications for the TELP program? I recently received my Civil Engineering technologist diploma from BCIT. Congratulations! Our TELP/EIT program has just completed for the year, but we encourage you to check back at the end of the year and early into the new year when the program begins again. Is this program applicable for the internationally trained professionals with experience but working towards P.Eng designation? I was wondering if you could update me on the progress of the 2014 TELP Program. Sorry to hear that Alicia. We did connect with the hiring lead and were informed that they were in the process of reviewing applications and will be notifying applicants once decisions have been made. Any plans for TELP or EIT road shows in Feb/Mar 2014? I’m looking for dates in Victoria BC early Feb. The TELP/EIT road show has already been and gone in Victoria, but there is still time to apply as the competition is open until midnight on February 9th, 2014. Hope that this helps! I am interested,in both TELP and /or EIT ,I have Bs.c degree in civil engineering and experience in roads,bridges,utilities,infrastructure ,and residential/commercial building,also I almost completed Construction Operation Program in BCIT and enrolled in BERM Program( Building Energy Resources Management)at Douglas Coolage . Thanks for your interest in these postings. Please visit the job postings and submit your resume through the online system.